Welcome to the webpage for the Rotaract Club of Moray! Welcome to the webpage for the Rotaract Club of Moray. Rotaract is a unique international service organisation for people aged 18-30, offering a wide range of activities that will enable you to try something new, whilst having a great time and meeting others. 5. To motivate young people for eventual membership in Rotary. Originally founded in the United States in 1968, Rotaract came to the UK and Ireland in the early 1970s. There are just currently over 60 clubs in the Great Britain and Ireland (GB&I), and more than 7,500 clubs across 155 countries worldwide. Rotaract Club of Moray are a young group of individuals that are willing to do good for the people of Moray. 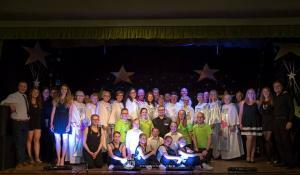 Since forming in 2010 the strong group of individuals have gone on to organise and assist with many high-profile events in Moray, including the Carnivals in 2012 and 2013, A Night at the Musicals in 2016 and 2017, A Ladies day in 2017 and many other events. These events have led to Rotaract Moray being able to donate £1000's to many local and national charities.